Previously we mentioned about LightScreen and GreenShot that can snapshot screen in simple way, but if you are looking for a more powerful screen capturing tool that can even capture animation on top of still image, the Free Screen Capturer from Evensoft could be a good solution. By simply touching on the PrintScreen button, it will bring up the utility menu with multiple selections, making it a complete screen capturing solution for more effective work. Once installed and launched the software utility, it will bring users to a simple GUI. Basically there are three main categories namely Capture Source, Capture Mode and Capture Destination that allow users to configure based on own needs. 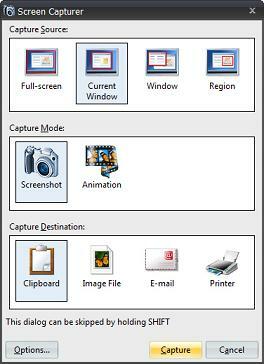 Under the Capture Source, users can select the captured region either in Full-screen, Current Window or by Region. On the other hand, users can choose the desired Capture Destination so that the captured screen can be saved into Clipboard or Image File, appeared in email attachment or even sent to printer for quick printing. Unlike other capturing tools that only capture still image, Screen Capturer has been enhanced with Animation mode that enables users to capture animation or movement to be saved into Movie File, which can be quite useful especially when you are trying to show certain procedures to run some program installations or create an online tutorial. That is not all, users can click on Option button to further customize the settings such as video Frames per second, movie type or configure hotkeys for quick function activations. If you think this is useful , just get a free download at Extensoft for immediate use.